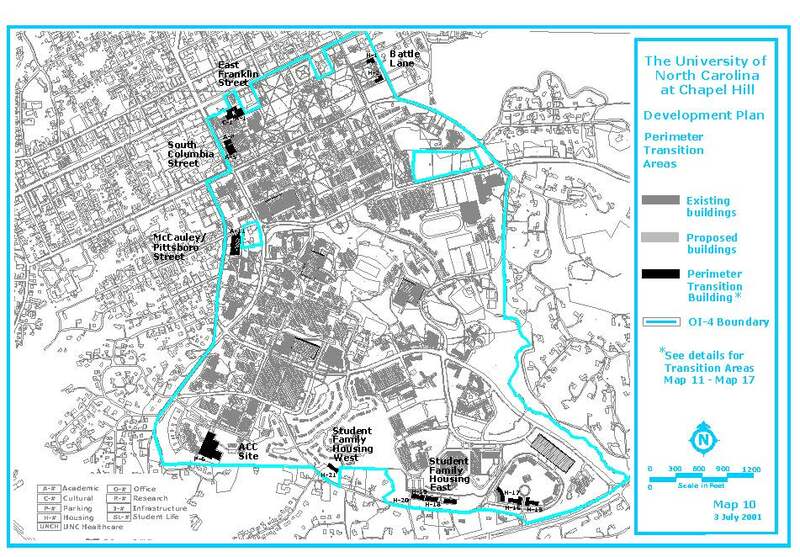 In the Battle Lane perimeter transition area, the development plan proposes additions to existing residence halls. The adjacent property is zoned R-1. In the East Franklin Street perimeter transition area, the development plan proposes two buildings; one is designated for cultural use and the other for academic. The adjacent property is zoned TC-1. In the South Columbia Street perimeter transition area, the development plan proposes two buildings and an underground parking structure. The adjacent property on the west side of South Columbia Street is zoned OI-1. In the McCauley/Pittsboro Street perimeter transition area, the development plan proposes an academic building with one level of parking structure. The adjacent property on the west side of Pittsboro Street is zoned OI-1. In the ACC Site perimeter transition area, the development plan proposes and addition to the ACC for the UNC Health Care System and a parking structure. The adjacent property is zoned R-2. In the Student Family Housing perimeter transition area, the development plan proposes housing buildings along Mason Farm Road. The adjacent property is zoned R-1. Each Site Development Plan for buildings within the approved development plan that are located in a perimeter transition area shall conform to the attached standards for the applicable perimeter transition area.